Published on 16. 06. 2014 in comics and cartooning and commentary and criticism. Closed Tags: Information, Johan F. Krarup. For et par uger siden blev min anmeldelse af Johan F. Krarups topunderholdende Cliffs monologer fra sidste år offentliggjort. Check den her. Published on 02. 03. 2013 in comics and cartooning and journal. Closed Tags: Christoffer Zieler, Johan F. Krarup, Maren Uthaug, Politiken. Som tidligere nævnt sad jeg i juryen for Politikens tegneseriekonkurrence. Tidligere i dag annonceredes vinderen, såvel som anden- og tredjepladsen. Maren Uthaug tog førstepladsen med Ting, jeg gjorde — en version af hendes vidt læste blog. Nummer to blev Christoffer Zieler med Arbejdstitler, mens tredjepladsen gik til Johan F. Krarups Uoplyst optimisme. En fornem vinderakkompagneret af to fornemme runners-up. Ovre på Nummer9 har Thomas T interviewet Maren i anledningen og jeg selv giver ham også et par ord med på vejen. Her er Marens tegnede reaktion. Published on 27. 12. 2012 in comics and cartooning, documentation, film, tv, video and journal. Closed Tags: Christia Skovgaard, Cool Comics, Daniel Milan, Gammel Holtegaard, Johan F. Krarup, Peter Madsen, Rikke Bakman, Rikke Villadsen, Søren Glosimodt Mosdal, Stine Spedtsberg, Sussi Bech, The Animation Workshop. So, Cool Comics — the exhibition I co-curated at Gammel Holtegaard (greater Copenhagen) — is over. For a show running just a month on a modest budget and with very little prep time, I was impressed with what they pulled off at the gallery and it seems it was a success, with a good number of visitors and lots of media coverage through its run. 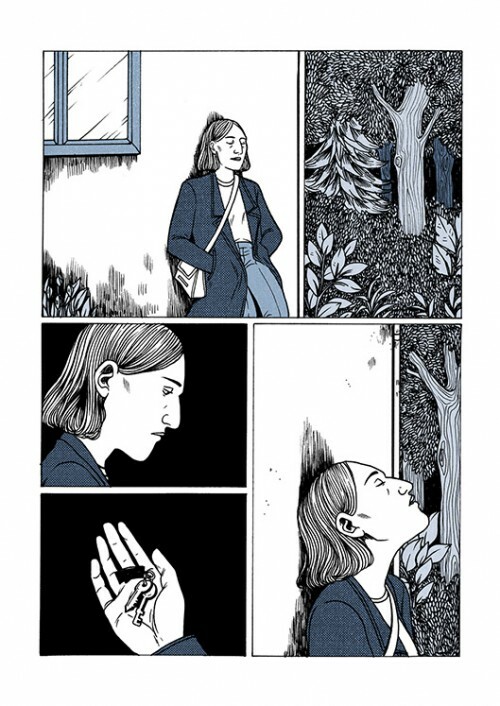 The director Mads Damsbo is really dedicated to showcasing the intersection between popular culture and high art and is planning to continue to do so in the coming years with new iterations of the Cool Comics idea. Color me excited that we have a gallery that devotes its energy simultaneously to such forms as comics, animation and digital media and to once popular, now enshrined high art such as the drawings of François Boucher — the object of a world class selection of drawings displayed beautifully at Gammel Holtegaard just prior to Cool Comics. Click on over to the Bunker’s photo page to experience our virtual walk-through of the exhibition courtesy of our ailing Canon Ixus camera. 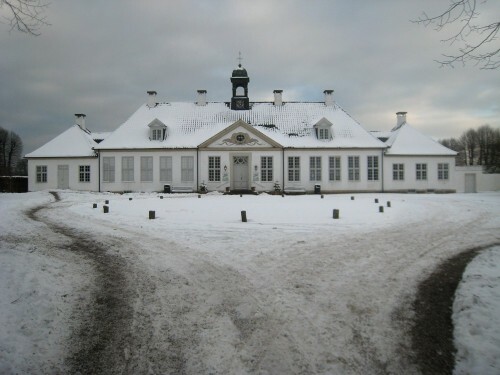 Enjoy, and keep an eye on future shows at Gammel Holtegaard! Published on 02. 03. 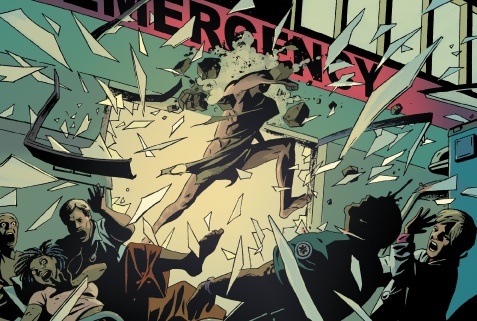 2012 in comics and cartooning and commentary and criticism. 2 Comments Tags: Johan F. Krarup, John Arcudi, KOLOR KLIMAX, Nikoline Werdelin, Peter Snejbjerg, Ping Awards, Ping-prisen, Rikke Bakman, Rikke Villadsen. KOLOR KLIMAX Sneak Release — The Photos! Published on 24. 11. 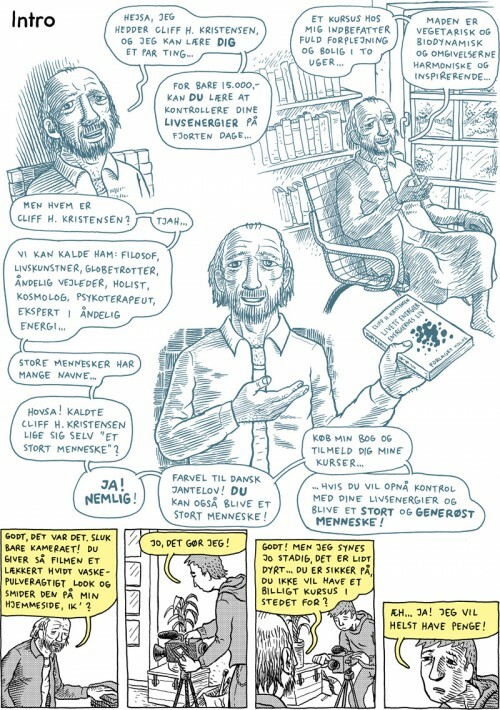 2011 in comics and cartooning and documentation. Closed Tags: Bart Beaty, Fantagraphics Books, Gitte Broeng, Johan F. Krarup, KOLOR KLIMAX, Mikkel Damsbo. 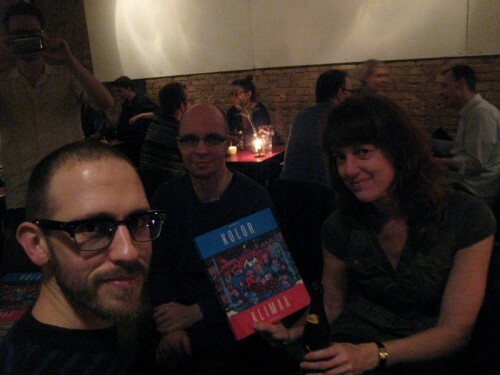 Johan F. Krarup, Henrik Andreasen and Marianne Eskebæk Larsen at the release party. 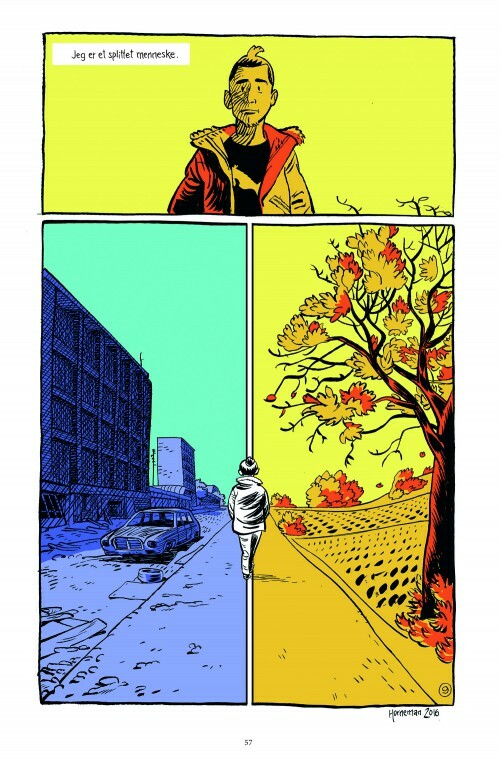 As mentioned here previously, last Thursday saw the Danish sneak release of the Nordic comics anthology KOLOR KLIMAX (to be released in the US and internationally by Fantagraphics Books in March). It was a fine evening; lots of Copenhagen comics folk turned out. Here are some photos hastily snapped at idle moments. Enjoy!